Free Shipping Included! Wisamic 5-3/4'' 5.75'' LED Headlight - with Halo DRL Compatible with Harley Davidson Dyna Street Bob Super Wide Glide Low Rider Night Rod Train Softail Deuce Custom Sportster Iron 883 -Silver by Wisamic at Zona Indonesia. MPN: M020033. Hurry! Limited time offer. Offer valid only while supplies last.  EASY PLUG AND PLAY INSTALLATION - Direct fit 3 prong plugs(H4) on headlight. Installation usually takes in 20 minutes or less.  DURABILITY - 100% original high-performance Osram LED lamps. Shock and vibration resistant projector lens encased in a black durable aluminum housing. Shock-proof waterproof(IP65). More than 50,000 hours lifespan.  BRIGHT PERFORMANCE - Super bright light pattern over standard incandescent lamps. Cut through the night. Valid irradiation distance is much more longer than normal bulb. 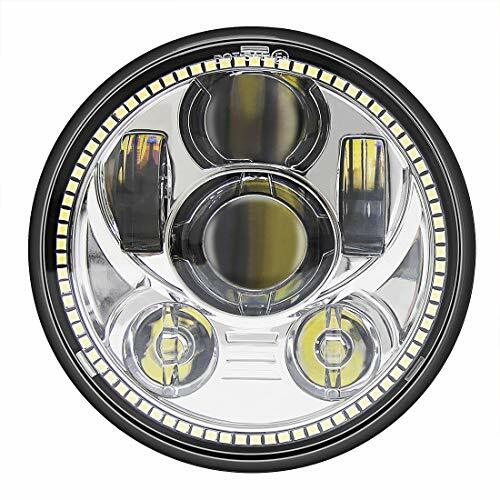  COMPATIBILITY - Fit for bike with 5.75" round LED headlamp kit,including dyna,low rider,wide glide,sportster,super glide,super low,nightster,sreet bob,forty eight,iron 883,seventy two,cvo breakout,softail and more. Find more compatibility information in product description.